Museum extension on the brink as public pushes for bike and pet access through new common area. 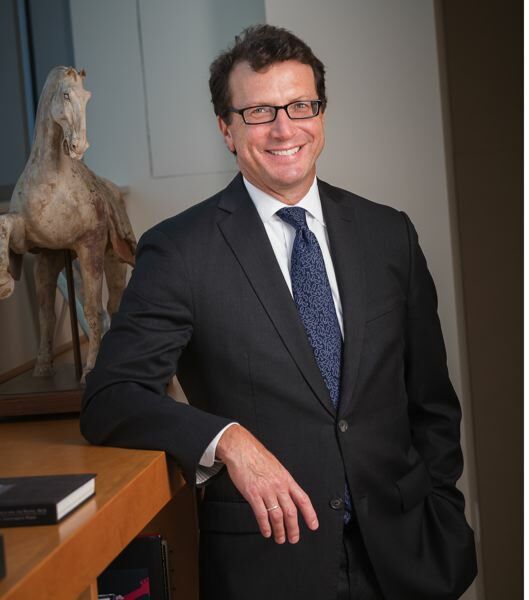 Portland Art Museum Director Brian Ferriso goes before the City Council at 2 p.m. Thursday, December 7, to make a case for the museum's possible remodel. At issue is how much access the proposed glass pavilion will allow to non-museum users. The addition, for which the museum is still raising money, is designed to connect the current two buildings, which are otherwise only linked by a tunnel and a courtyard. The land was originally part of a city street, Southwest Madison Street. In 1968 it was vacated by the city, with an eight-foot-wide easement for the public to cut through between 10th Avenue and Park. In 1984 that ordinance was adjusted, because of vandalism, and the museum and then Masonic lodge were allowed to close the easement between 11 p.m. and 7 a.m. In April 2017, the museum faced opposition in online discussions and at City Council for the idea of only allowing pedestrians free passage through the pavilion during museum hours (10 a.m. to 5 p.m. Sunday through Wednesday and 10 a.m. to 8 p.m. Thursday and Friday). Pets and bikes were also to be barred. Now the museum is asking the council to modify the city ordinance to allow for the enclosed passageway. The hours will reflect what the ordinance currently allows. Ferriso says they heard the complaints and are now offering that the pavilion provide access to people, pets and bikes from 7 a.m. to 11 p.m. seven days a week. Cyclists would walk their bikes through building. Any art on show in the commons would be protected by security guards. "There was a lot of pushback about dogs and bikes and we heard that pushback." "We aspire way beyond ADA, because there are other issues, such as with ageing. We want this to be more a function of the city, like a library, for the museum to function as a resource, not just an attraction." 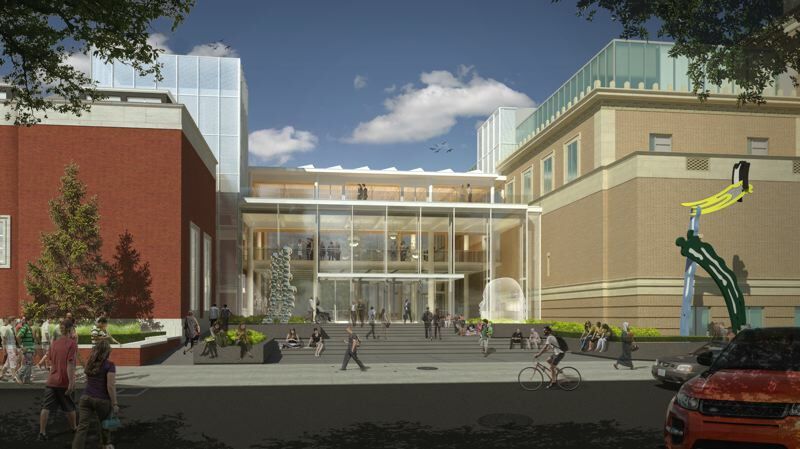 The new design would add not just 30,000 square feet in the pavilion, but also 9,840 square feet of gallery space within the museum. Various rooms and spaces would be switched around. For example, the Crumpacker Library would be moved deep into the administrative side of the Mark Building and the library space becomes the Crumpacker Gallery. The current Park Avenue entrance, the Warren entrance, would become the Warren Gallery and the doors closed with the original iron gates. Since the main entrance to the museum would move the pavilion, the loading dock, where art trucks currently vie for space with families, would be removed to the south side of the building on Jefferson Street. "Twelve years ago I came to this museum because it is downtown, with great facilities, and part of my mission has been around making accessibility, diversity and inclusion part of our audience and our programs," Ferriso told the Business Tribune. "The next important stage is that our campus needs to be more accessible facility wise." 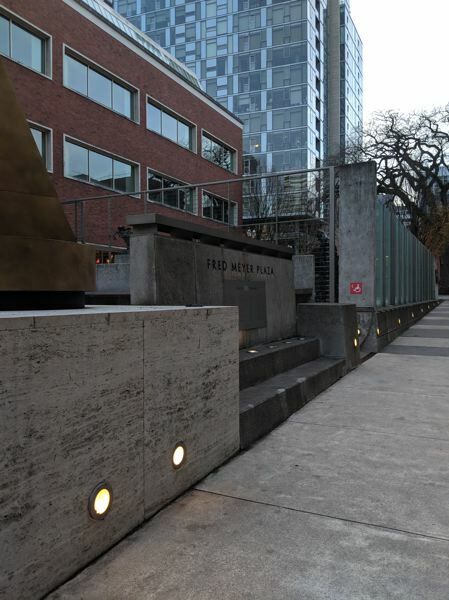 The new design allows for "three new barrier-free connections at three levels between the buildings, and improved vertical way finding and elevator access," according to the museum's web site. Ferriso said museum-goers often do not make to the Jubitz Center for Contemporary Art because they have to get there by tunnel. That wing of the museum (the Mark Building) is also difficult to navigate by wheelchair. In a bid to make the narrative not just about access to art but access for people of all abilities, the museum is forming an accessibility advisory committee and holding an ADA (Americans With Disabilities) audit in early 2018. 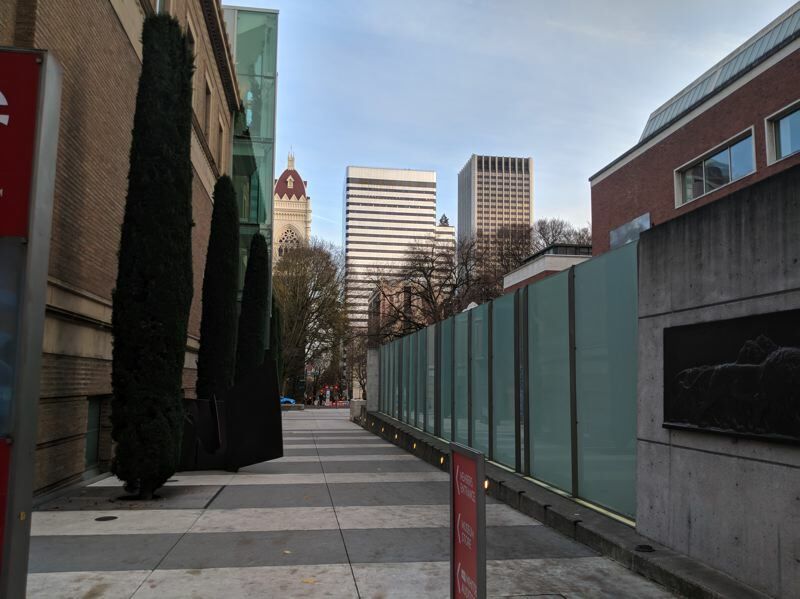 Funding for the Rothko pavilion prjoect comes mostly from the private sector, with $1 million coming from the State of Oregon. The new communal spaces will also be used for events such as the literary festival Wordstock, the heART of Portland arts showcase, concerts and Potluck in the Park Christmas Dinner. Ferriso says they have been talking about joining the two buildings for several years. Two years ago Vinci Hamp Architects of Chicago made the current design, which is still subject to change. The museum has raised $21 million of the hoped for $50 million capital campaign-plus-$25 million towards the museum's endowment. That endowment stands at $54 million, but Ferriso says it should be more like $100 million, in line with other city museums like Denver and Cincinatti. He did not want to go into debt for capital expenses. Asked where the cyclists will wheel their bikes through, he said, "These are concepts, maybe the doors will be in the center, maybe there'll be an air lock." The museum and architect spent a lot of time restructuring the floors to make them accessible and to increase gallery space. The pavilion was secondary. "The pavilion became an envelope to help us start to fundraise." He added, "Visibility increases awareness and that encourages gifts." The museum has been using a consultant to help explain the ways of the Portland City Council. Although the proposal has four co-sponsors, that does not guarantee it four yes votes. "This is a project that's been looked at for a number of years. We want a single ground floor for accessibility, and that requires this ordinance change." And what if it fails and the museum is not allowed to cover the easement and make it a part time passageway for the public? The stakes are high. "I think we would not be able to do the project, because we wouldn't be able to build the structure," he says. "It wouldn't make any sense." Groundbreaking is scheduled to take place in 2018, with completion expected in late 2020 or early 2021.